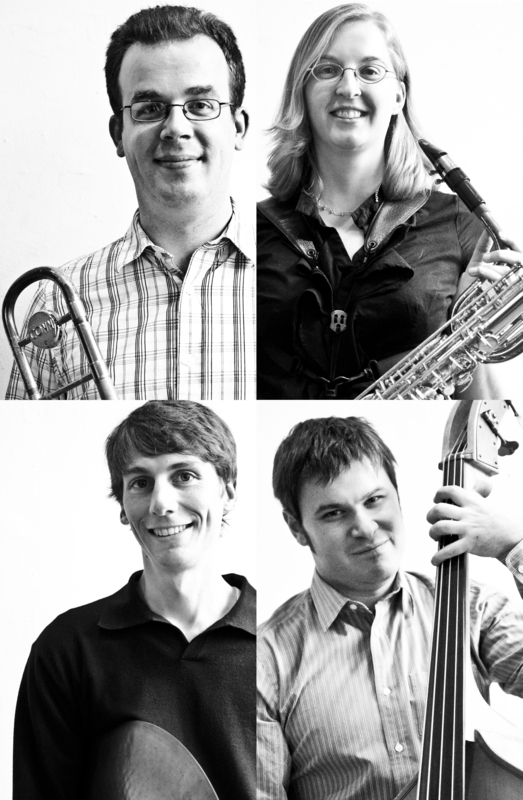 The members of this Boston-based group perform regularly in the greater Boston area and throughout New England. If you’re interested in booking the Olson Pingrey Quartet or if you’d like more information about the band please contact Kathy Olson at (617)959-9708 or send an email to kathyolsonmusic@gmail.com. Kathy Olson is a jazz baritone saxophonist based in the Boston area but originally from Charleston, West Virginia. On the baritone saxophone, alto saxophone, flute, clarinet, or bass clarinet Kathy has performed and/or recorded a variety of styles from contemporary big band to indie rock. In addition to co-leading the Olson Pingrey Quartet, Ms. Olson also leads a The Composers Saxophone Quartet with Mark Zaleski, Rick Stone, and NYC based musician Sean Berry which performs new music by Boston-based jazz composers including Ms. Olson, Randy Pingrey, Rick Stone, Ayn Inserto, and Brian Friedland and others. In addition to her own groups she also performs regularly with the Brian Friedland Jazz Orchestra and the Ayn Inserto Jazz Orchestra. In April 2013 she performed as a guest artist with the University of Virginia Jazz Ensemble where the group premiered her big band composition and arrangement of her tune Tygart Valley as well as a 10-piece arrangement of her composition My Waltz. Randy Pingrey is a jazz trombonist based in Boston. He is originally from Wisconsin and his career got kick-started by the exciting indie-rock scene in Eau Claire, where he was an early member of the Grammy-award winning band Bon Iver. Since moving to the East Coast he has performed and recorded with jazz musicians like Frank Carlberg, Bill McHenry, Anthony Coleman, and Jerry Bergonzi, with indie rock bands like Akron Family, Land of Talk, and Mega Faun, and with classical musicians like Norman Bolter, John Faieta, and Doug Wright. He can be heard on CDs for the Tzadik, Saddle Creek, Red Piano, and Jagjaguwar labels. He is also a regular performer with the latin band Ritmo Masacote, the Beantown Swing Orchestra, and the Metal and Glass Ensemble. Randy’s other projects include a trombone duo with Tom Plsek, the Randy Pingrey Trio which is a group that explores the boundaries between improvised and experimental music, and a solo trombone project. In addition to his regular performance career he is also a faculty member at Berklee College of Music as well as part of the theory faculty at The New England Conservatory of Music Prep School.